Mega Niche Media, 9781604870114, 268pp. There is, perhaps, no better time than now to go back to the basics. The world has become so chaotic, so out of control, yet with everything that has changed, the desire for fame and fortune will always remain constant. Whether you want to have more money, uncover your true purpose so you can help others, look and feel better, or attract true love, it's now time for you to claim your share. The basics, so simple yet profound, are exactly what Baltasar Gracian Morales has laid out for us in this book. 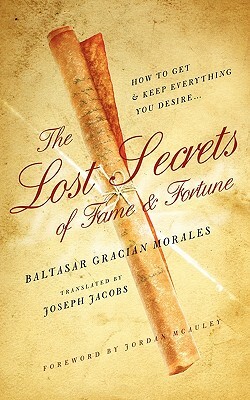 The Lost Secrets of Fame and Fortune contains over 300 maxims for getting - and keeping - everything you desire. The keeping is just as important as the getting. We have all witnessed too many people achieve their dreams, have it all, then lose everything as quickly as a sandcastle when the tide comes in. This is NOT the Law of Attraction, and this is NOT the Secret. These are real, actionable, practicable secrets of how to get your share of the fame and fortune you deserve. You can get MORE out of your life. Don't wait, the time to start putting this life-changing principles into action is now.